A bar made of ice? I think we can all agree that's pretty cool right? ICEBAR London is tucked away just off Regent's Street in Heddon Street Food Quarter and is the UK's only permanent bar made from ice. And this week I gave up my very mundane Monday night in, to enjoy a chilled night out at ICEBAR London for #BloggersBelowZero. 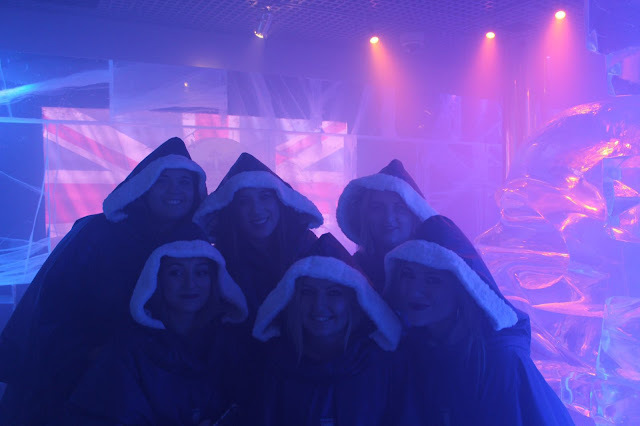 Organised by friend and fellow blogger Lauren from Blonde Vision and hosted by the ICEBAR Marketing Manager Tom, #BloggersBelowZero is a cold experience I will never forget! On arrival, we had a tasty cocktail or two in a dimly lit industrial-esque underground bar called the Below Zero bar and lounge and shortly afterwards we headed upstairs to enjoy yet another cocktail, but in sub-zero temperatures instead! Before entering the Ice Bar we were dressed (very quickly) in a thermal cape-come-poncho with gloves and hood to help keep the cold at bay. And once inside I was completely taken aback. ICEBAR is impressive. With walls, bars and tables made from ice all harvested from Sweden, the venue offers a fully immersive experience, unlike another other venue I've visited in London. Admittedly the ICEBAR itself was smaller than I expected, but the "rock" themed bar didn't disappoint. Amongst the stars, drum kit and wall sculptures the main star of the rock show was undoubtedly the very large skull ice sculpture that sat on-top of an icy table. And like the easily amused girl that I am, I loved the fact the drinks were served in square tumblers made from ice, which surprisingly didn't stick to my lips! And yes, I did ask the bar staff if they got cold and they assured me they had set shifts, so don't leave work frozen stiff! Overall, I can't fault ICEBAR London. Would I visit again? Well, every year the bar is completely reconstructed and redesigned, so I definitely wouldn't say no to a return visit. And the 40-minute time slot was just long enough before my nose got too cold to take a decent selife! So, whether you're a Londoner or tourist, Ice Bar rocks and is definitely a London venue to add to your bucket list. I for one enjoyed every second and every "sip"! Have you ever been below zero?